The most fundamental skill needed to assemble any electronic project is that of soldering. Soldering is the process of joining two metals by the use of a solder alloy, made by combining tin and lead in different proportions. It takes some practice to make the perfect joint, but like riding a bicycle, once learned is never forgotten. The idea is simple: to join electrical parts together to form an electrical connection, using a molten mixture of lead and tin (solder) with a soldering iron. Most irons run from the mains at 240V. However, there are low voltage types (e.g. 12V or 24V) that generally form part of a "soldering station" and are designed to be used with a special controller made by the same manufacturer. Typically, they may have a power rating of between 15-25 watts or so, which is fine for most works. A higher wattage does not mean that the iron runs hotter - it simply means that there is more power in reserve for coping with larger joints. The simplest and cheapest types don't have any form of temperature regulation. Simply plug them in and switch them on. Thermal regulation is "designed in" they may be described as "thermally balanced" so that they have some degree of temperature "matching" but their output will otherwise not be controlled. Unregulated irons form an ideal general-purpose iron for most users and they generally cope well with printed circuit board soldering and general interwiring. Most of these "miniature" types of iron will be of little use when attempting to solder large joints. A proper temperature-controlled iron will have some form of built-in thermostatic control, to ensure that the temperature of the tip of the iron is maintained at a fixed level and also guarantees that the output will be relatively stable. Consist of a complete bench-top control unit into which a special low-voltage soldering iron is plugged. Some versions might have built-in digital temperature readout, and will have a control knob to enable you to vary the setting. The temperature could be boosted for soldering larger joints; these are designed for continuous production line / professional use. The best stations have irons, which are well balanced, with comfort-grip handles which remain cool all day. A thermocouple will be built into the tip or shaft, which monitors temperature. Select a suitable tip according to the thickness of the lead to be soldered. It is available with different diameters or shapes, which can be changed depending on the type of work in hand. Often, tips are iron-coated to preserve their life, or they may be bright-plated instead. A third factor to consider is thermal linkage. This is the area of contact between the iron tip and the work. Figure 2 shows a view of a soldering iron tip soldering a component lead. Heat is transferred through the small contact area between the soldering iron tip and pad. The thermal linkage area is small. 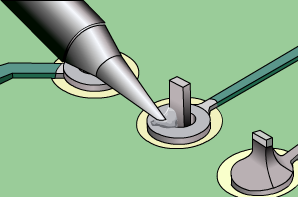 The below figure shows a view of a soldering iron tip soldering a component lead. In this case, the contact area is greatly increased by having a small amount of solder at the point of contact. The tip is also in contact with both the pad and component further improving the thermal linkage. This solder bridge provides thermal linkage and assures the rapid transfer of heat into the work. A solder gun is a pistol-shaped iron, typically running at 100W or more, and is completely unsuitable for soldering modern electronic components: they're too hot, heavy and unwieldy for microelectronics use. Soldering irons are best used along with a heat-resistant bench-type holder, so that the hot iron can be safely parked in between use. Cleanliness, temperature, time, adequate solder coverage are the key factors affecting the quality of the joint. All parts - including the iron tip itself - must be clean and free from contamination. Dirt or surface oxide is the enemy of a good quality soldered joint. Hence, it is an absolute necessity to ensure that parts are free from grease, oxidation and other contamination. Another side effect of having dirty surfaces is the tendency for people to want to apply more heat in an attempt to "force the solder to take". This will often do more harm than good because it may not be possible to burn off any contaminants anyway, and the component may be overheated. In the case of semiconductors, temperature is quite critical and applying such excessive heat may harm them. When the hot solder comes in contact with a copper surface, a metal solvent action takes place. 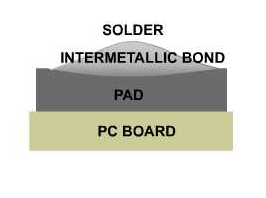 The solder dissolves and penetrates the copper surface. The molecules of solder and copper blend to form a new alloy, one that's part copper and part solder. This solvent action is called wetting and forms the intermetallic bond between the parts. Wetting can only occur if the surface of the copper is free of contamination and from the oxide film that forms when the metal is exposed to air. Also, the solder and work surface need to have reached the proper temperature. New tips must be tinned immediately when used for the first time. Tinning components involves applying a thin coat of solder to the surface to be soldered. This greatly helps in achieving a good joint and should be done whenever possible. A continuously tinned surface must be maintained on the soldering iron tip's working surface to ensure proper heat transfer and to avoid transfer of impurities to the solder connection. It’s better to re-apply a very small amount of solder again, mainly to improve the thermal contact between the iron and the joint, so that the solder will flow more quickly and easily. Insert the components and splay the leads so that the part is held in place. Scrape the Printed Circuit Board and lead of the component using steel wool to remove oxidation. Use a small hand-held file or scrape using a knife blade or rub a fine emery cloth over them to reveal fresh metal underneath. After preparing the surfaces, avoid touching the parts afterwards if at all possible. To form the component properly– check whether the component easily goes inside the PCB. Flux removes oxides which arise during heating, and is seen as a brown fluid bubbling away on the joint. Flux is a solvent consisting of natural or synthetic rosins to remove oxides on the copper surface. It is non-corrosive and non-conductive and will not affect the circuitry. To make any good solid joints, the components have to be both physically and chemically clean as the solder needs to actually get into the components not just on them. Scraping the leads of the components and dipping the leads in flux and apply flux on the pads of the PCB also helps to remove the surface oxides in the soldering process. Another step to successful soldering is to ensure that the temperature of all the parts is raised to roughly the same level before applying solder. Imagine, for instance, trying to solder a resistor into place on a printed circuit board. it's far better to heat both the copper PCB and the resistor lead at the same time before applying solder, so that the solder will flow much more readily over the joint. Heating one part but not the other gives a far less satisfactory joint, so strive to ensure that the iron is in contact with all the components first, before touching the solder to it. The melting point of most solder is in the region of 188°C (370°F) and the iron tip temperature is typically 330-350°C (626°-662°F). The latest lead-free solders typically require a higher temperature. Next, the joint should be heated with the bit for just the right amount of time - during which a short length of solder is applied to the joint. Do not use the iron to carry molten solder over to the joint. Excessive time will damage the component and perhaps the circuit board copper foil too. Heat the joint with the tip of the iron, then continue heating whilst applying solder, then remove the iron and allow the joint to cool. This should take only a few seconds, with experience. The heating period depends on the temperature of your iron and size of the joint - and larger parts need more heat than smaller. In general, the soldering iron tip should be applied to the maximum mass point of the joint. This will permit the rapid thermal elevation of the parts to be soldered. Molten solder always flows from the cooler area toward the hotter one. Before solder is applied, the surface temperature of the parts being soldered must be elevated above the solder melting point. Never melt the solder against the iron tip and allow it to flow onto a surface cooler than the solder melting temperature. To solder, place the tip of the soldering gun directly against the area to be soldered and carefully apply the hot solder to the area where the soldering gun touches the metal. Only apply the minimum amount of solder needed to set the connection; excess solder will run into the other components of your project. Never blow on the hot solder or try to use the connection before it is completely cooled. This will create small fractures in the metal joint and weaken the bond between pieces. The final key to a successful solder joint is to apply an appropriate amount of solder. Too much solder is an unnecessary waste and may cause short circuits with adjacent joints. Too little and it may not support the component properly, or may not fully form a working joint. How much to apply, only really comes with practice. A few millimeters only, are enough for an "average" PCB joint. When cleaning is required, flux residue should be removed as soon as possible, but no later than one hour after soldering. Some fluxes may require more immediate action to facilitate adequate removal. Mechanical means such as agitation, spraying, brushing, and other methods of applications may be used in conjunction with the cleaning solution. Care should be taken to avoid the need for re-soldering. When resoldering is required, quality standards for the re-soldered connection should be the same as for the original connection. A cold or disturbed solder joint will usually require only reheating and reflowing of the solder with the addition of suitable flux. If reheating does not correct the condition, the solder should be removed and the joint re-soldered. All parts must be clean and free from dirt and grease. Try to secure the work firmly. "Tin" the iron tip with a small amount of solder. Do this immediately, with new tips being used for the first time. Clean the tip of the hot soldering iron on a damp sponge. Many people then add a tiny amount of fresh solder to the cleansed tip. Heat all parts of the joint with the iron for under a second or so. Continue heating and then apply sufficient solder, to form an adequate joint. Remove and return the iron safely to its stand. 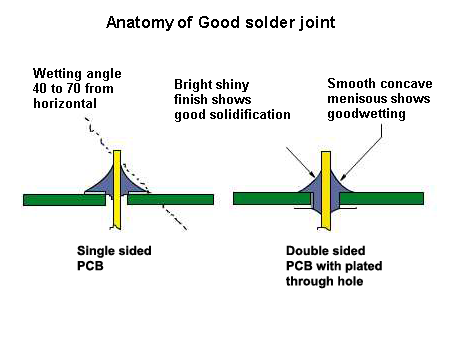 It only takes two or three seconds at most, to solder the average PCB joint. Do not move parts until the solder has cooled. The end of the wire or lead is covered with solder. Soldering iron should be kept ON only when the soldering is being done. It should kept OFF, when it is not used. Remember that when soldering, the fumes in the solder are harmful to your eyes and lungs. Therefore, always work in a well ventilated area. Hot solder is also dangerous. Be sure not to let is splash around because it will burn you almost instantly. Eye protection is also advised. Don't use a big soldering iron and the big 1/4-inch, acid-core. Anything higher in wattage, like soldering guns will generate most of their heat by passing an electrical current through a wire. Be careful not to apply your soldering iron for long periods of time. Otherwise, you can damage sensitive components or burn up a circuit board trace. Do not use too much solder - a strong joint relies on a good fit and a little solder. Don't settle for a poor joint – if in doubt start again. Never touch the element or tip of the soldering iron. Never put it down on your workbench, even for a moment. Work in a well-ventilated area. Overheated - de-wetting; lumps; dull; crystalline-like; looks as though sand has been thrown into the joint. Cold - poor wetting; stretch marks between the pad and lead. Fractured - poor wetting; stretch marks between the pad and lead. Non-wetting - solder balled up around the joint. Excessive solder - lead or wire contour is not visible and the shape of the solder is convex. Insufficient solder - hole is not covered; copper end is not sealed; it is not as wide as the wire or lead. De-wetting - usually excessive heat; solder balls up. This also occurs if an intermetallic compound is involved. Pinholes or voids - from dust, dirt, flux gas, improper heat or other contamination. Lumps and large holes - improper presoldering cleaning and outgassing from flux gas. Damaged wire insulation - excess heat and/or wicking of solder under the wire insulation.